Observation - Snail Shells (Half Eaten) - UK and Ireland. Description: Groups of half eaten snail shells found on a riverbank, often next to a tree trunk. 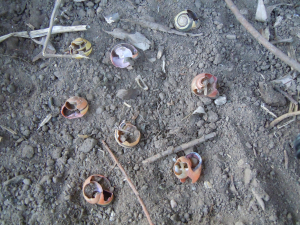 groups of snail carcasses occurred along different points of the river. Does anyone know what species of animal would leave remains like these? Groups of half eaten snail shells found on a riverbank, often next to a tree trunk. groups of snail carcasses occurred along different points of the river. Does anyone know what species of animal would leave remains like these?